In a world that is becoming more technology driven, having an online presence is a must for any business. In the Local Consumer Review Survey carried out in 2015, 92% consumers responded that they occasionally read online reviews for local businesses, 68% said that they trust a local business with positive reviews and 51% consumers will select a local business if it has positive reviews. Moreover, in another study by Ipsos, it was reported that 48% people use the Internet to search for products/services and 61% start by searching on the web. Therefore, it is imperative for any business to maintain a proper online presence and more importantly, rank on the first page of search engines. Targeting the right keywords to rank higher on search engines is the most important step in any SEO campaign. Keywords are what basically match your website content to what users search for. 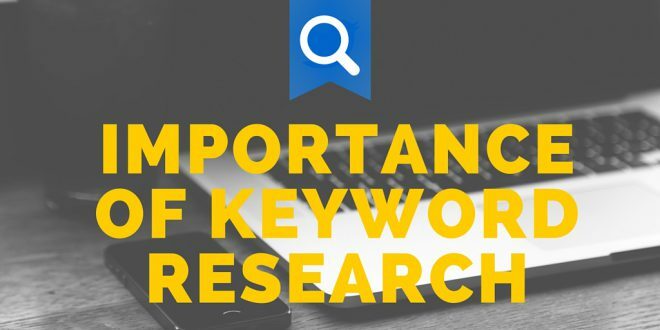 This why it is essential to utilise ‘Keyword research’ as part of your growth strategy online. Because as important as it is to rank higher, you don’t want to appear in search results for services which you don’t provide, as it will increase your bounce rates. Put simply, Keyword research is a process of researching what potential customers search for in search engines. Most of the search terms are about 2 to 3 words long, called Head terms. Such keywords are often very competitive and it is difficult to rank higher on search engines only by targeting these keywords. Long-tail Keywords, meanwhile are longer than three words and can be very specific to your products/service. The popularity of such terms has increased rapidly since the advent of voice search. 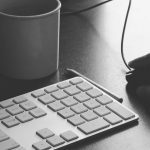 Due to the nearly infinite possibilities of how a Long tail keyword can be created, they are often easier to rank for because of the less competition. There are many methods for researching keywords. 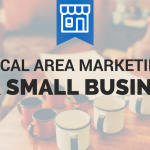 It can be as simple as when you search for your particular business niche on Google and you are automatically suggested a list of related commonly searched terms. There are many free tools available like Google keyword tool which can help you plan and target the right keywords, but if you really want a successful SEO campaign, consider investing in the proper keyword research tool. There are many available in the market. 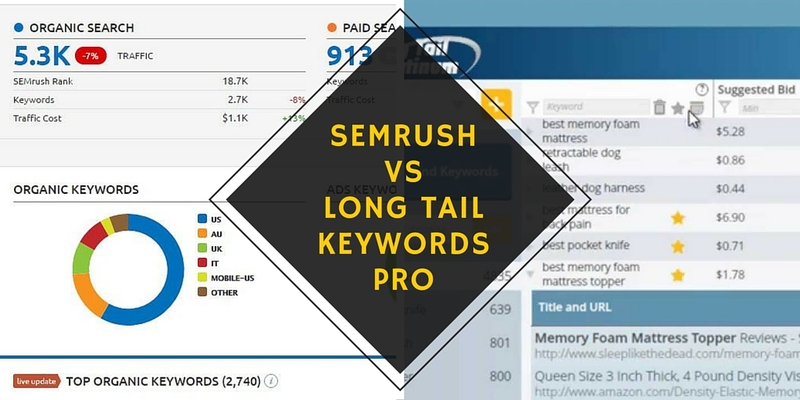 SEMrush and Long Tail Pro are the two most popular ones. Both of these tools offer different features and serve different purposes, but fulfilling the same objective- to help you find the right keyword. Let’s take a detailed look at both of these tools and help you decide which is more suitable for your SEO campaign. REVIEW: Long tail Keyword Pro, as the name suggests helps you to search for less competitive long tail keywords. You can enter up to 5 seed keywords at once and Long Tail Pro will provide you numerous related long tail keywords. You can filter the results for the minimum number of searches and CPC. Long tail Pro allows you to filter real-time as you type the seed keywords. For each of the results, Long Tail Pro shows you the top 10 sites competing for that particular keyword including their keyword usage in Title and Meta tags, Domain and page authority, the number of backlinks, etc. Based on the competitiveness, Long Tail Pro utilizes a complex algorithm to determine the Keyword Competitiveness (KC) metric, ranging from 0 to 100. A value between 30 denotes low competition and that above 70 means very high competition. You can see what competitors in your business niche are willing to pay to get their ads displayed through the PPC analysis. Based on your final choice of keywords, you can search whether a particular domain name is available or not through an inbuilt tool. This feature comes in pretty handy for users looking to build a very specific business niche website. Long Tail Pro has a feature to help you monitor your search terms and domain rankings and trends on the three major search engines, Google, Yahoo, and Bing. As you keep filtering the results, there is a tool to add notes to keep your choices organized. Finally, you can easily export these results to an Excel file and save them for further use. REVIEW: SEMrush is more of an all-rounder tool to boost your search engine rankings. It offers many features and tools. The unique feature offered by SEMrush and unarguably the best one is that it shows you which keywords your competitors are ranking for and which ones are they bidding for. The SEMrush Advertising Research feature allows you to enter the URL of your competitor site and you can see the keywords they are targeting, their most profitable ad copies, their budgets, their AdWords and Bing Ads usage trends and all their PPC marketing activities. The SEMrush Display Advertising feature further allows you to analyse the best-performing advertisers’ sites and their media ads, their promoted landing pages, the number of ads placements they employed, etc. This tool allows you to analyse industry’s leading advertisers’ ad headlines, text, and images and therefore find ideas to monetize your website. The SEMrush Backlink Checker shows you links that are pointing to your website, along with parameters for their authority and also shows you their geolocation. SEMrush also functions as a conventional keyword researcher. You can enter a seed keyword, and you will get two reports. The first, “phrase match” returns a list of search terms that include your seed keyword. The second “related keyword” offers you search terms that are related to the seed keyword and do not necessarily include the seed keyword. All the search results can be sorted and filtered based on the number of searches and average CPC bids. There is also a PLA competitors tool, which is aimed at e-commerce retailers to analyse their competition in product listing ads. The features offered by both these tools can help you boost your SEO campaign considerably. The Internet penetration is increasing on a daily basis, and more people are getting technology-conscious. With 80% of modern consumers trusting online reviews as much as personal recommendations according to Brightlocal, this is no longer an age where a business can survive based on word of mouth recommendations. 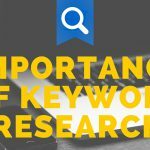 A small amount invested in these keyword research tools can help you be seen by the thousands of users who search on Google every day, and increase your customer base. Instead of blindly spending thousands of dollars on product listings and visual ads, these tools show you ways through which you can outmatch your competitors and minimize your investments in the process. Media Hut Digital is a boutique digital agency helping small to medium businesses to take advantage of the online market and do better online.